Advisory lanes are a form of bicycle infrastructure consisting of an unlaned road with dashed lines and often colored pavement on the outside of a center zone. The dashes are meant to suggest areas in which bikes should ride and thus, areas cars are meant to stay out of should there be a bike present. However, if there is not a bike filling the advisory lane, cars are permitted to — and often need — to enter the advisory lane. Throughout our two-day bike tour of the Delft area, we visited three advisory lane sites: Hugo de Grootstraat, Adriaan Pauwstraat, and Delfgauw. Advisory lanes are particularly interesting due to the fact that despite their relative simplicity, they are one of the hardest forms of bicycle infrastructure to grasp by those who have never seen them before, such as in the United States. The roads on which advisory lanes are implemented can vary in their function and width, from small roads barely wide enough for two cars to pass, to larger neighborhood principles nearly wide enough for two dedicated bike lanes. 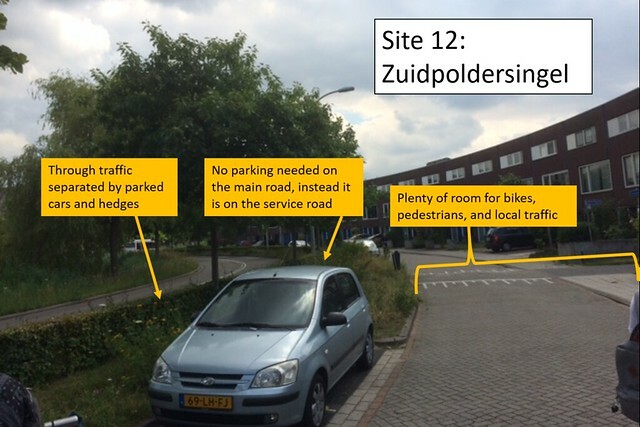 Site 7, Adriaan Pauwstraat, fits the former of these descriptions: its center zone, at ten and a half feet, its center zone is not wide enough for two cars. However, the road seems exceptionally safe for pedestrians, bicycles, and cars. The segment of road shown in the photo below includes elements that contribute to the safety of all three. The advisory lanes give bikes a priority space that separates them from cars. Also shown is a crossing island, which affords pedestrians the luxury of crossing only one half of the street at a time. These islands are not normally seen on roads with advisory lanes, but this particular road is very long and straight (without many crosswalks), so the median also acts as a traffic calming measure. Hugo de Grootstraat fits the latter of the two descriptions above: it is much wider than Adriaan Pauwstraat and much more trafficked. 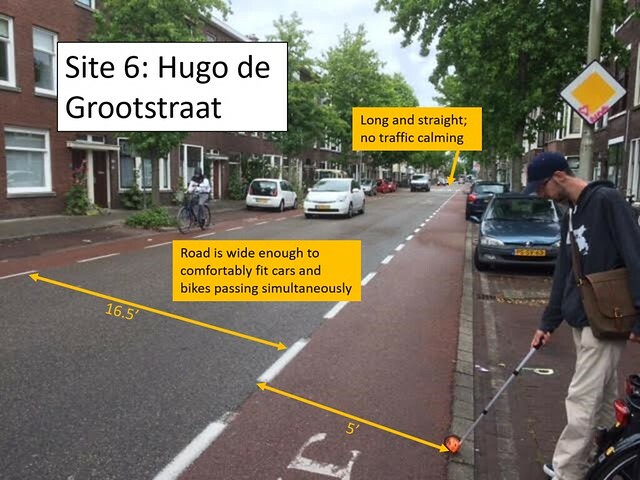 Instead of a ten and half foot center zone, Grootstraat has a sixteen and a half foot median, which is almost wide enough to constitute a 1+1 street. 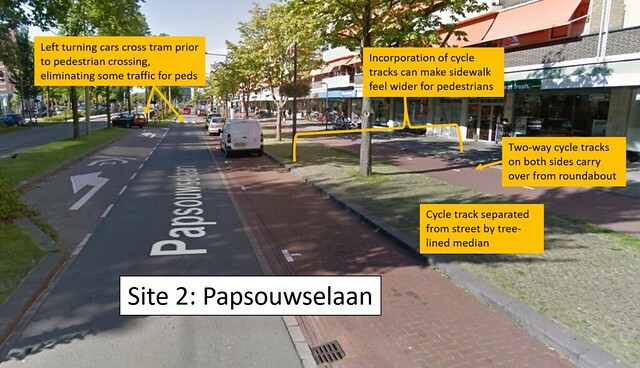 In addition, due to the width, Grootstraat’s speed limit is higher than Pauwstraat’s (50 kph vs. 30kph respectively). 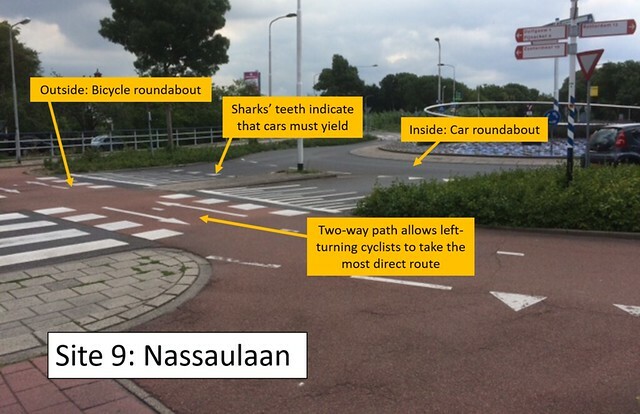 Despite this, and despite that there are no significant traffic calming techniques, Grootstrat does not feel any more dangerous than Pauwtraat. I attribute this its width; because Grootstraat is both unlaned and relatively wide, cars give bicycles quite a wide berth. That being said, Grootstraat is long and straight, so during peak hours it has the potential to feel unsafe. It could benefit from traffic calming elements. The final advisory lane visited, Delfgauw, was on a rural road where the bicycle infrastructure is not up to the standard seen within cities. 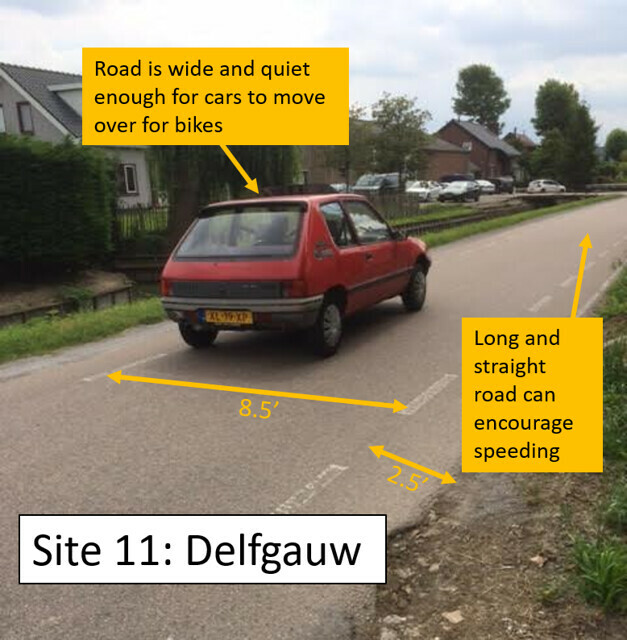 As it is a rural road, the updating of Delfgauw’s bicycle infrastructure is not likely a top priority. However, it riding on the road does not feel particularly unsafe despite their measly two-foot advisory bike lanes. The only time I felt unsafe on Delfgauw was when a car sped by at about twenty kph over the speed limit. Bike lanes are a step up from advisory lanes. Traditional bike lanes are street-level bike infrastructure that is separated from traffic by painted lines only, there is no vertical separation. 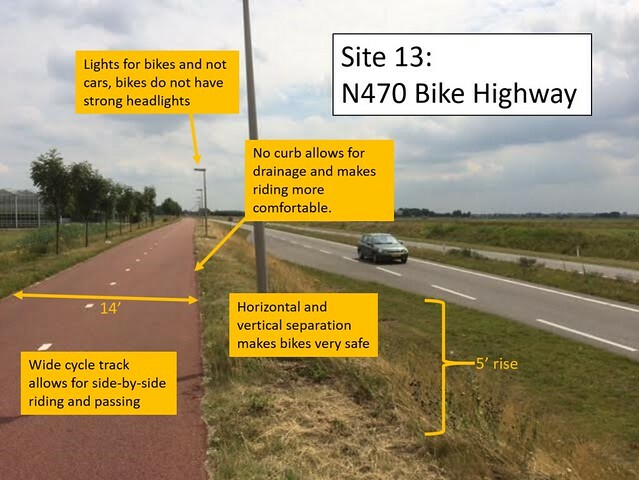 New bike lanes are not being build much in the Netherlands because generally they are considered slightly more stressful and dangerous than cycle tracks due to the lack of separation from traffic. 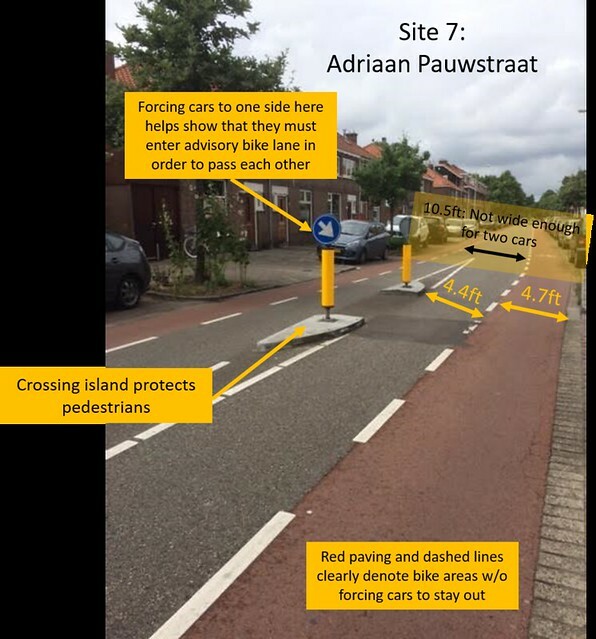 However, it is possible for bike lanes to provide defensible space to cyclists and they are acceptable for new road in the Netherlands if the road meets two main criteria. Namely, if the new road is only one lane in each direction and has no on-street parking, it is acceptable for bike lanes (some on street parking is sometimes permitted if it is low-turnover). On our bike tour, we visited a total of three sites at which bike lanes were implemented: Buitenhofdreef, Julianalaan, and Nassaulaan, all in Delft. 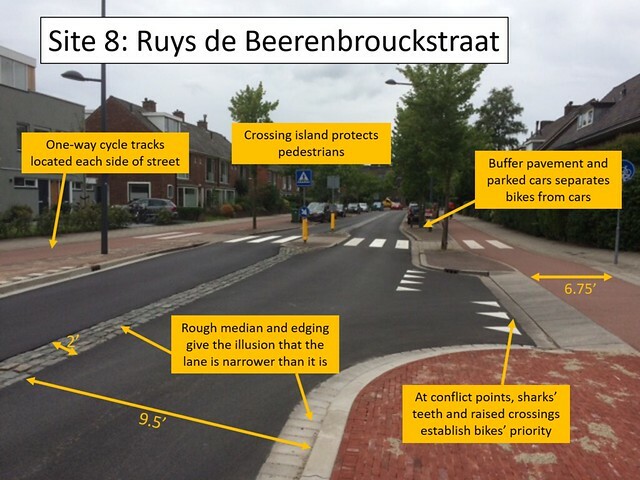 Some of these roads are compliant with the Dutch criteria for new bike lanes, and some are grandfathered in to the rules. The first site, Buitenhofdreef, seems to fit the acceptable criteria for bike lanes. It is likely classified as a local distributor/collector. However, it is only one lane in each direction and limited access. This creates a continuous bike lane on one side for cyclists which reduces stress. However, because the road is for through traffic only, cars tend to go quite quickly, which makes it uncomfortable to ride on this road. Furthermore, instead of trying to calm traffic, the Dutch, in an effort to ensure safety, seem to try to make the bikes as predictable as possible. This is achieved by having strictly one-way cycle tracks, including one way crossings for bikes trying to cross this street. While this likely does help with safety somewhat, it makes riding on the street more inconvenient. 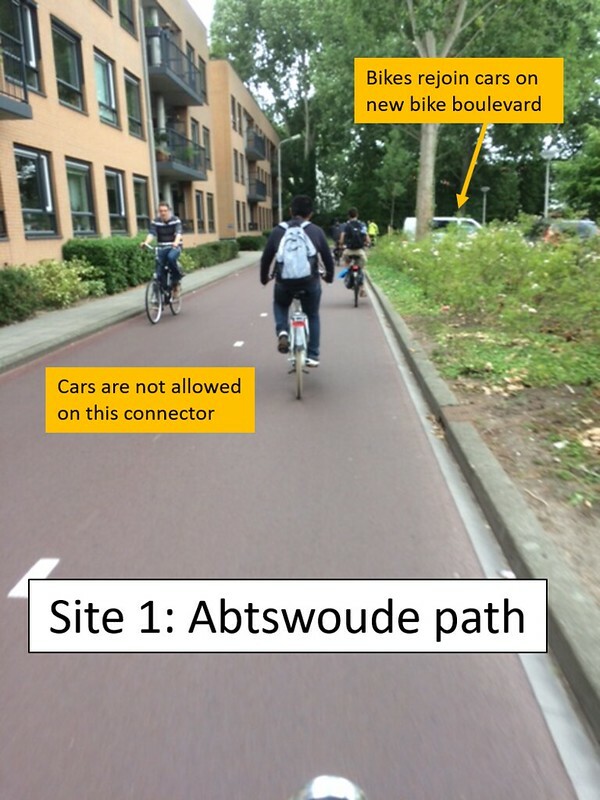 The next site does not at all fit the criteria set forth by the Dutch government. Julianalaan is a 1+1 arterial, but has parking on the side and splits into several lanes at large intersections. This site, however, is a good example of the use of pocket bike lanes. Pocket bike lanes are bike lanes that are in between two traffic lanes and are intended to minimize conflict between bikes and cars at intersections. However, if there are too many lanes, pocket lanes cannot do enough to completely alleviate stress. When bike lanes come to intersections, the Dutch are particularly clever at making sure everything stays safe and low-stress for both bikes and cars. Nassaulaan is a good example of this. At the site, bike lanes run into a roundabout. To keep people from breaking any rules, accidentally or not, each of the one-way bike lanes become two-way once in the roundabout. The bike lanes then run on the outside of the roundabout and cars must yield to them at all times. This in turn acts an additional traffic calming measure as cars must slow and stop for passing bikes. Cycle tracks are, in more than one sense, a step up from bike lanes. Not only because they are safer and less stressful, but because in many cases, they are literally a curb step up from the road. Cycle tracks are defined as bike paths that are separated from the road by some kind of vertical elements (flexposts, curbs, trees, parked cars, etc.). On our tour, we also visited three sites at which cycle tracks were located: Ruys de Berrenbrouckstraat, Papsouwselaan, and Voorhofdreef. Ruys de Berrenbrouckstraat (known henceforth as Ruys de B-straat) is the best example of classic, well-designed cycle tracks. B-straat used to be an important east-west route in Delft with cars going quite fast. Residents of the street soon complained and a great design was implemented that still allows for through traffic, but limits the traffic’s speed and keeps things very safe for pedestrians and bicycles. Sometimes, cycle tracks arise because roads are narrowed and extra room on the side is converted. 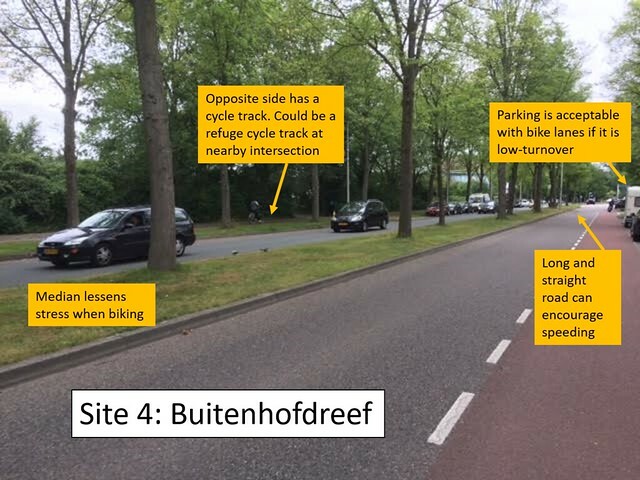 This looks to be the case in the next photo of Voorhofdreef, which shows the road narrowing from two lanes to one, and a two-way cycle track on the right. Two-way cycle tracks are sometimes considered unfavorable because they create complications at intersections. However, in this case, two-way tracks are favorable because the intersection ahead is one of the most complicated and well designed in Delft. It is a sort of a roundabout in which public transit is given absolute priority, followed by bikes and pedestrians, and finally cars. On the other side of that same roundabout, cycle tracks are found on a commercial street. In this case, I think the main purpose of the cycle tracks is to separate the storefronts and sidewalks from the street, while still allowing cars access to the shops. In the photo, one can see a massive space between the shops and the road and tram. This makes shopping, walking, and cycling much more pleasant as no one has to worry about cars. A bike boulevard, according to the city of Berkeley, CA, is defined as “a low-speed, low-volume street which has been optimized for bicycle traffic.” Bike boulevards are designed to discourage motorized through traffic, but encourage bicycle through traffic. 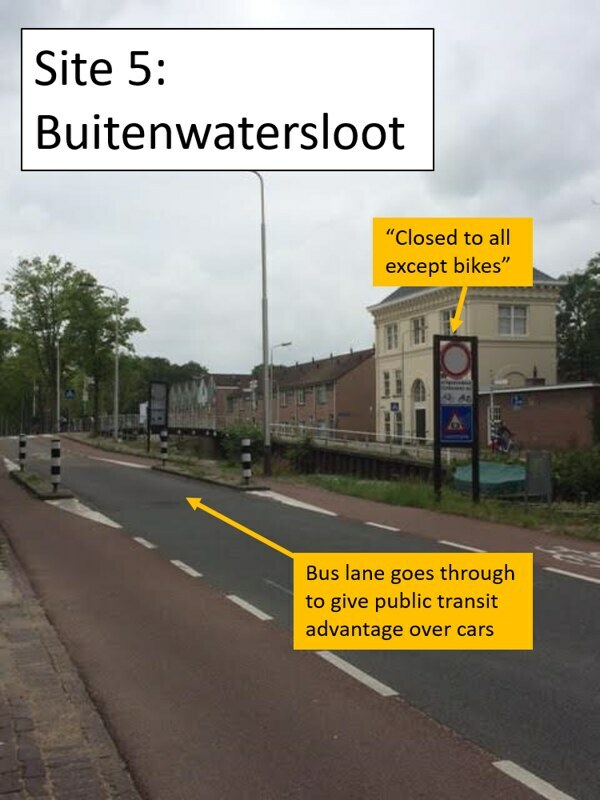 There are many different way in which this can be accomplished, two of which can be seen in the two boulevard sites visited in Delft: Buitenwatersloot and Abtswoude path. Buitenwatersloot used to be the most popular thoroughfare that connected the center of Delft to the main train station. However, as cars got faster and bigger, a new road was needed and built. The municipality then wanted to discourage use of the old route and convert it into a bike boulevard. This was accomplished through a permeable barrier. This barrier allows bikes and buses through but has a camera fitted to catch any cars trying to go through the barrier. This makes the road discontinuous and therefore not attractive to through traffic. The Abtswoude path employs similar permeable barrier techniques, but this time instead of breaking up a continuous road, these barriers connect neighboring roads. That way bikes can easily go from one neighborhood to another (in this case, to and from TU Delft) by cutting from road to road, while cars must wind around discontinuous roads. Service roads are a form of infrastructure that allows slower traffic to separate themselves from through traffic. They are small roads that are no more than a block long that split from a main through road. There are many uses for service roads, such as allowing delivery trucks to stop without holding people up, allowing residents of the street a quiet place to park or play on the street, or allowing bikes a low-stress and safe place to ride. The service road we visited in Delft could serve any of these purposes, but is especially good for bikes, as it employs similar bike connectors seen in the Abstwoude path above. Bicycle highways are very similar to the highways on which we are all familiar driving, in that they are wide, smooth roads designed to connect more distant points of interests to one another with faster riding. The bike highway we visited, the N470, connects Delfgauw to Delft and ran parallel to a traditional auto highway. It felt the safest of all the sites we visited due to the thorough separation between bikes and cars, and the width of the bike track.